That’s right we are joining forces! You get three instructors working to give you the utmost in care and assistance. We will create a fun fast paced Milonga Weekend! If milonga is your cortina, we’ll change that by giving you the best foundation possible or if you just want to polish up on what you already know we will help you enjoy more of tango with the funnest dance in the genre. What is more… if you haven’t done a full weekend workshop, try it. There is a special bond that forms between all participants that lasts for years! The necessary fundamentals and steps on which to build your milonga foundation! The Habanero Beat! The beat that drives milonga! How to speed it up without moving into a runaway train! 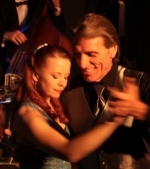 There are brief moments in every milonga song when the beat doubles… we will explain your options and choice so you know what to do when this happens. How to find musicality without stressing your partner. Choices and discoveries made with a clear and fun-loving heart! Making the most of what you already know when how and where you might use your existing repertoire and tango vocabulary in dancing to the rhythms of milonga. Using common sense and letting go of control. Location Depending on enrollment! Either the Milonguita studio or a larger dance studio.